Eagle Superabrasives manufactures a variety of diamond, Borazon and carbide grinding wheels for all your superabrasive needs. We can manufacture just about any wheel that your facility requires. Our grinding wheels feature either continuous or segmented rims. We use over six core materials – including aluminum, steel and composites – to maximize your productivity. In addition, our advanced bond systems feature exclusive formulations of polyimide, phenolic, metal and hybrid bonds that increase the life of your grinding wheel. We can even manufacture wheels as thin as 0.2mm and with a diameter as large as 700mm, and everything inbetween. No matter what industry you’re in, we can create the superabrasive to meet your needs. The diamond’s renowned hardness makes for an ideal abrasive. 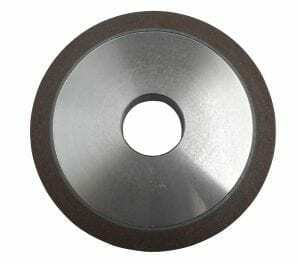 As a result, diamond grinding wheels became an industry standard among available superabrasives. However, it’s carbon makeup dissolves iron at high temperatures, making diamond wheels inept at grinding steel. CBN wheels feature the Borazon crystal, which rivals the diamond in hardness. Because the crystal is a cubic form of boron nitride, it can withstand high temperatures and still maintain an incredible amount of accuracy. We’re known for our diamond and CBN wheels, but we also expertly manufacture CDX wheels. These grinding wheels feature a combination of diamond and CBN powder, bonded with resin. We specially formulate the wheels to grind tungsten carbide and steel, including carbide tools, knives and Bac Pac systems. Whether you’re looking for glass, tool steel, super alloy or carbide grinding wheels, we’ve got you covered. And with our stock of over 6,000 wheels at our Hickory, NC location, we can ship 90% of orders same-day. In just seven days, we can create and ship custom wheels as well. Our experienced staff provide unparalleled customer support. Their technical support and advice will guide you in selecting the right wheel from our large inventory of high quality products. Contact us to order your superabrsaives today!